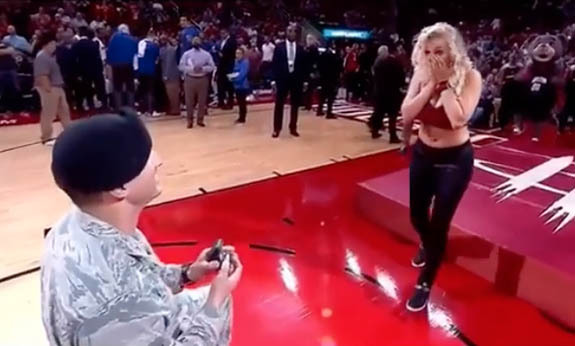 A blindfolded Houston Rockets dancer got the surprise of her life on Friday when a silly halftime stunt turned into a heartwarming on-court marriage proposal. Casey Potter, a veteran Rockets Power Dancer, thought she was being a good sport by participating in a halftime attraction that would feature Clutch, The Rockets Bear, hitting a trampoline, propelling himself over the dancer and slam-dunking a basketball. 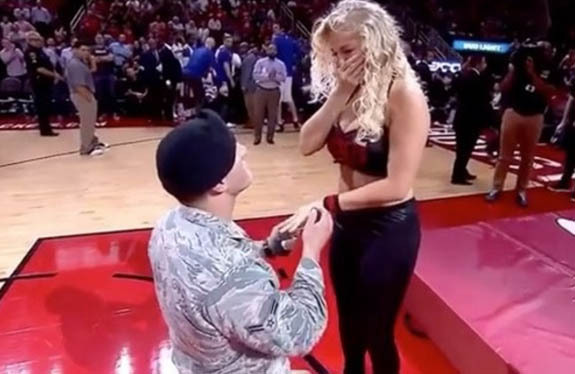 While the Humble, Texas, native stood blindfolded facing center court near the free-throw line, her boyfriend, Travis Ross of the U.S. Air Force, had sneaked onto the court to pop the question in front of a sold-out arena of excited basketball fans. Potter had no idea that her boyfriend had returned home from active duty. 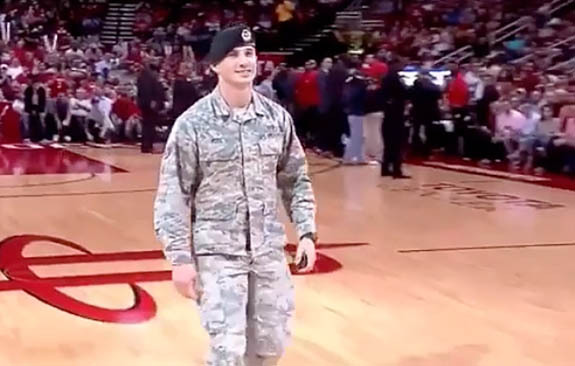 When the Rockets' halftime announcer untied Potter's blindfold, the Airman First Class was already down on bended knee with a ring in hand. Potter initial reaction was priceless — and awkward — as she stumbled backward and plopped down on the thick mat that was intended for the high-flying stunt. Somewhat embarrassed and still in shock, she covered her face for a moment and tried to regain her composure. Then, she stood up with her right hand over her mouth and her left hand held by her kneeling boyfriend. Ross continued with his proposal, which she happily accepted. 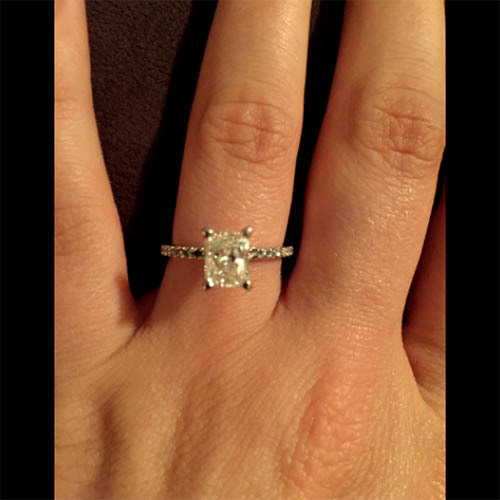 In case there was any doubt as to how she reacted when her new fiancé placed the lovely four-prong diamond ring on her finger and asked her to marry him, Potter wrote on her Twitter page, "I definitely said YES!!" The couple also got a congratulatory message on the Rockets Power Dancers' official Instagram page: "We may have lost the game [against the Detroit Pistons] but we'll win your heart with this very special proposal! Casey thought she was getting dunked over by Clutch, The Rockets Bear. Instead she got a ring on it! Congratulations Travis and Casey!" Needless to say, Clutch never got to perform the flying slam dunk. Credits: Screen captures via Instagram/OfficialRPD; Ring shot via Twitter/CaseyPotter68.